An import tool for loading performance data for provincial departments from various external data sources, such as the Infrastructure Reporting Model (IRM). A questionnaire tool for collecting capability-related data directly from the same provincial departments, and other key stakeholders. The second item formed the bulk of the functionality that needed to be developed. National Treasury officials needed a system where they could create a questionnaire based on a number of indicators, and then publish those questionnaires directly to various officials within the provincial departments. They would then log into the system, complete the questionnaire, upload supporting evidence to substantiate their responses, and then submit the questionnaire for approval by a nominated senior official. The same questionnaire was completed by a variety of ‘perspectives’ relating to that provincial department, such as the department itself, the custodian, provincial treasury, and any implementers (e.g. Public Works). These multiple perspectives were then synthesized to produce a final view of the capability of the department, taking all the different perspectives into account. 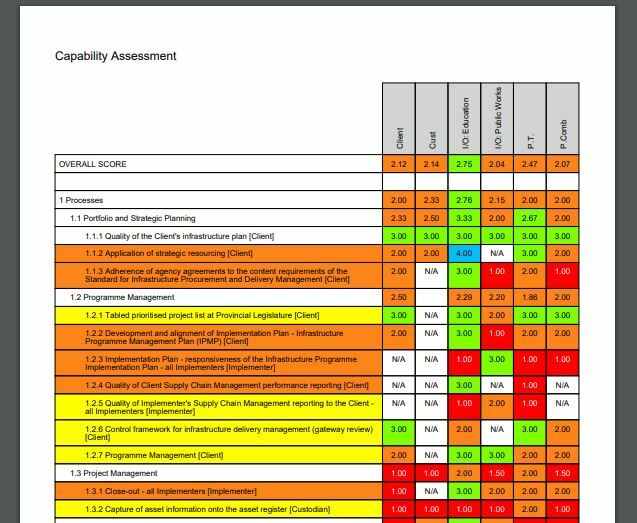 Once the capability process had been completed and the performance data was uploaded, an integrated PDF report could be generated for each provincial department, which compares the capability against the performance to give a sense of the capability maturity of that department. Additional reports and data visualisations included an Improvement Plan, outputs of the performance and capability data, and a number of charts and graphs to assist with completion and data analysis.